Heavy-metal stamping has taken on a whole new look at heavy-gauge stamping specialist Rockford Toolcraft, thanks to recent installation, end to end, of a pair of two-ram mechanical presses linked by a servo-based transfer system. Everything about the setup, dubbed Brutus by the company, screams of heavy metal—from the beefy coil line to the sturdy transfer system that moves stampings, as heavy as 50 lb., along four rams and 27-ft. of combined bed length. It’s all housed in a new 30,000-sq.-ft. building addition, with 42-ft. ceiling and 30-ft. pit. We walked the line as it pounded out cross members for Class 8 truck frames, 50-lb. chassis parts stamped from 75-lb. blanks sheared from 5⁄16-in.-thick Grade 50 high-strength low-alloy (HSLA) steel. You can watch the heavy-metal stamping press crank out the parts by viewing my brief editorial video in our online Multimedia Center: www.metalformingmagazine.com/video. Brutus, at Rockford Toolcraft, features two twin-ram 2200-ton presses installed end to end, connected by an HMS servo-based transfer system and fed (at far right) by a Feed Lease coil line with 60-in.-wide coil capacity and maximum steel thickness of ½ in. Rockford Toolcraft emerged in 1976 when tool and die maker Jerry Busse, still the family-owned firm’s president, invested $10,000 to build stamping dies. The firm grew rapidly through the ’70s and by the early ’80s had 20 employees. During the mid-’80s some of its customers encouraged Busse to purchase their production presses and stamp their parts. 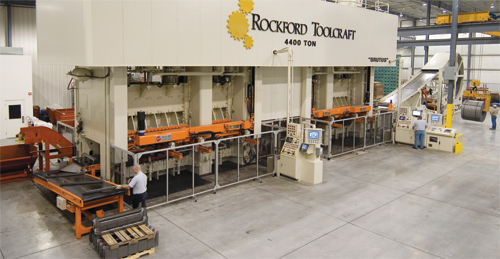 By the early ’90s, Rockford Toolcraft had fully leveraged the synergy of its tooling expertise and stamping equipment, to offer significant cost savings to its OEM customers. The firm, which processes more than 1.25 million lb. of steel per week, now houses 42 presses in 300,000 sq. ft. of production space spread among two buildings. Its press inventory includes a 1500-ton Clearing, three 1000-ton Minsters, five 800-ton presses and four 600-ton presses. “Our growth in the ’90s was fueled primarily by two markets,” Busse says, “agricultural and trucking.” Today, those two markets represent half of the firm’s business. It also stamps and assembles for the automotive and commercial hardware industries, among others. Als looking for opportunities to take his company—fearlessly—into uncharted territory, Busse first spied the two presses that have since become Brutus when touring one of his customer’s stamping facilities in 2003. The firm had been using the two twin-ram 2200-ton presses end to end to stamp a dedicated product line. When production quantities for the product line dwindled, the company sold the presses to Busse, who scrapped the transfer and feed systems, ordered new replacements and had the presses rebuilt—-new motors, clutches, bearings, etc. Added in 2007 were a new Series 900 servo-based transfer system from HMS, and a ½-in. by 60-in.-capacity feed line from Feed Lease Corp. (see article in MetalForming, June 2007, page 30). Exiting Brutus are Class 8 truck-chassis stampings formed in six hits under the press’ four rams. Each stamping weighs 50 lb. 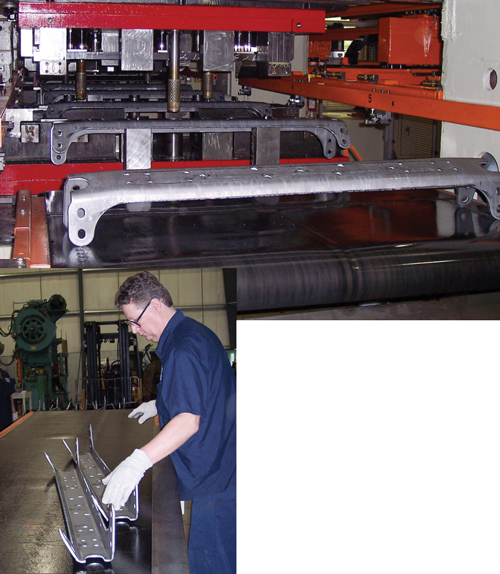 Stamping the Class 8 truck-chassis parts, 5⁄16-in.-thick steel feeds from 40,000-lb. coils. The first ram (1000-ton) powers a three-station progressive die that blanks and trims the HSLA steel. Then three single-hit stations under the remaining rams (1200-ton, 1200-ton and 1000-ton in sequence) punch holes, form and resize to remove springback. The tooling also must remove coil crown, as the straightener cannot remove the entire coil crown from the heavy stock. Other techniques developed by the firm include the use of severe shear angles on punch tooling, in addition to staggering the punches in sequence, to reduce tonnage requirements on HSLA-steel stampings. Busse showed me one job where punches had a 15-deg. shear angle. On the horizon for Rockford Toolcraft, in addition to continued growth in the agricultural and truck markets, are heavy-gauge stampings for the railroad industry. The firm stamps ¼- to 3⁄8-in.-thick hinges, brackets and other parts for rail cars. See also: Rockford Toolcraft, Inc., Feed Lease Corp.